Wonderful blog! A collection of collections! Now I need to dig deeper. 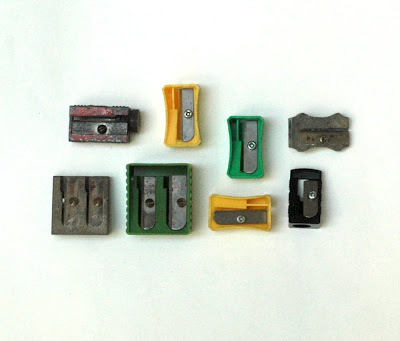 I miss old pencil sharpeners so much! I still use pencils whenever I can but sadly when I need to sharpen them I have to use an electric pencil sharpener and that is not as cool as the manual ones. they just keep getting better & better! my favorite is the light bulbs I think though. This is the most amazing blog. I discovered you last night, and your collections and how you organize them has completely changed the way I view my children's junk. I wrote a post about it today, linking to you. You have inspired me...thank you! I only discovered this blog like two days ago. I hope you'll keep it up into 2011...? By the way, I nominated you for a blog award. You can pick it up on my blog at http://collegegirlsdays.blogspot.com/2010/03/beautiful-blogger-award.html. Someone once told me they couldn't afford a pencil sharpener so she used a razor. there are called toppers here. your also topper for putting it together. I'd much rather use one of these than an electric one....they are so impersonal and harsh.